This article submitted by Linda Stelling on 5/9/01. Many area farmers finally got in their fields last week, when warmer weather dried out the soil before the last weekend's rain. With temperatures soaring last week, many farmers got started preparing their fields and planting. "Where the soil is lighter, farmers are planting," said Dan Martens Benton County Extension Educator. "For all practical purposes, the corn people will wait until the fields are drier." Dave Brinkman, who farms east of Paynesville, said spring planting has been going real well. The ground is wet in a few spots but has worked up well on his farm. Others, though, aren't so lucky, and spring planting continues to be slow, especially compared with the early plantings of the past few years. Phil Schmiesing, St. Martin, said he found frost about two feet down after getting stuck hauling manure. Schmiesing,who lives along the Sauk River, said his fields by the river (12 acres) are planted. On higher ground, tile lines are still frozen. "This is going to be an interesting year," he said. Tony Stalboerger, who farms north of Lake Henry, hasn't started any field work yet. Stalboerger expects to start spring planting sometime this week, weather permitting. Schmiesing and Stalboerger were hoping Saturday's rain would eliminate the last of the frost. 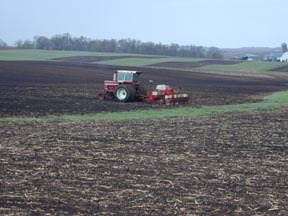 This has been the second wettest April in history, according to the Minnesota Ag Statistics Service, which has delayed the planting. Last year, the dry weather had farmers out in their fields in March. "Last year we had everything done already," Stalboerger said. An estimated four percent of the oat acreage statewide has been planted compared to 70 percent a year ago, according to the statistics service. Corn ground preparation has just begun at three percent compared to 79 percent last year. One good thing is that the moisture in the soil will help the seeds germinate. Last year it was too dry and the seeds sat in the ground without germinating. "Every year is different," said Martens. "At least this year, you know the moisture is there." "We need two good drying days then the farmers will really be opening things up and the mini lakes in the fields will be gone," said Patrick Kearney, Kandiyhoi County Extension Educator. While the planting is behind last year, it is not hopelessly behind. Under normal planting conditions, farmers are in the fields planting corn by May 6 and soybeans by May 18, Martens said. Martens doesn't feel farmers are in any serious trouble yet. However, every day that goes by, crops are missing out on some sunshine and growing days. "If farmers aren't in the fields by the end of the week," Martens said, "they will lose a couple of bushels of yield potential." Kearney agreed that the spring planting isn't that late yet. "Farmers have been spoiled the last three years as they were in the fields early," he said. Stalboerger said he isn't worried about getting into the field yet. In 1986, he didn't start planting until June. Martens said most seed companies are helpful and will accommodate customers by exchanging seeds for ones with a variety with a shorter growing season if they aren't in the fields by May 25. With the large equipment farmers have today, they can have everything done in eight to ten days or less, Kearney said. "It's not like the days when all they had were two or four- row equipment," he explained. "Once I get started I could have everything done in a week's time," Stalboerger said. "The fields are drying out. Farmers just need to be patient and persistent when the time is right," Martens said.